Many families debate over where to take their vacations each year, beach or mountains. While many families choose the endless waves of sunny beaches, just as many equally prefer a cooler retreat within dense forests and clear mountain streams. Who says you can’t have both on your Smoky Mountain Vacation? Not only does the Great Smoky Mountains take you to greater, and cooler heights, with peaks near 6,000 it offers some of the clearest, cleanest and most refreshing mountain waters, for swimming, tubing, splashing and more. So if you looking to beat the heat and cool off with a refreshing plunge or splash in a clear mountain pool or stream, never fear there are more water options than one might ever imagine in and near the Great Smoky Mountains National Park (GSMNP). For visitors seeking to experience the Great Smoky Mountains National Park (GSMNP) from a different vantage point, like floating or riding white water down a mountains stream, tubing is a fantastic option! The rivers and streams in and around the GSMNP offer a variety of wild white water rapids as well as gentler floats to enjoy the majesty of the mountains. Not only can you lounge back and let the water do the work, but visitors can bask in the cool waters and roll down some ancient riverbeds while taking in the grandeur of lush forests, towering mountain peaks, and the serenity that with water and nature. 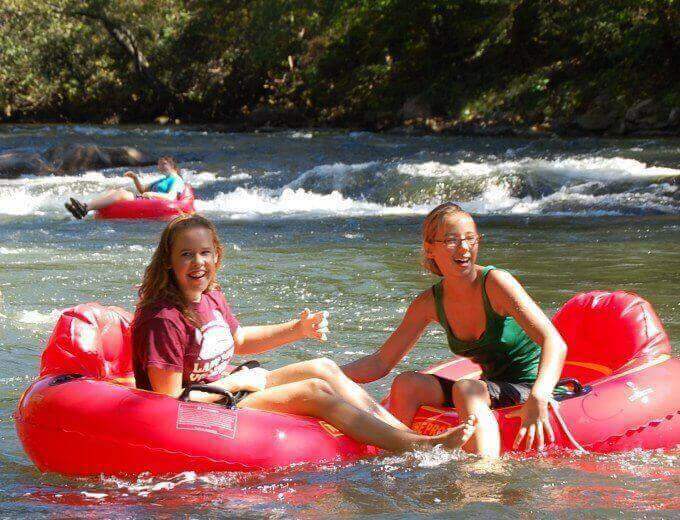 The Great Smoky Mountains Area features a wealth of tubing options so you can select just the right trip for you! 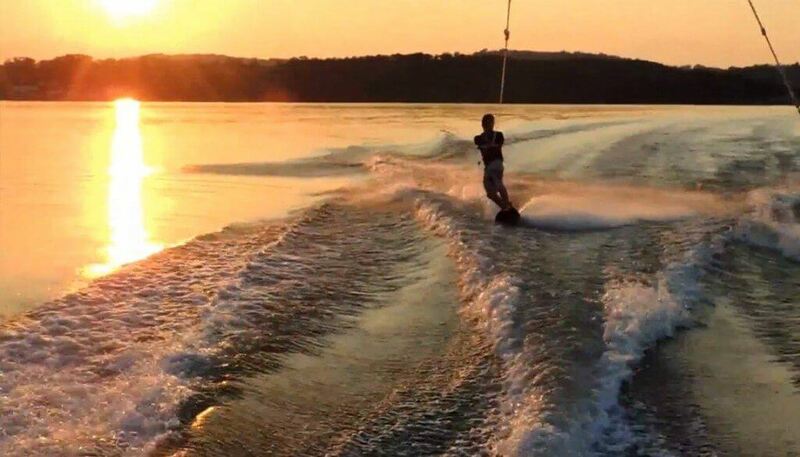 While some people rent their own tubes and create their own tubing adventure, numerous tubing companies offer guidance on specific routes provide shuttles, tube safety tips and more. 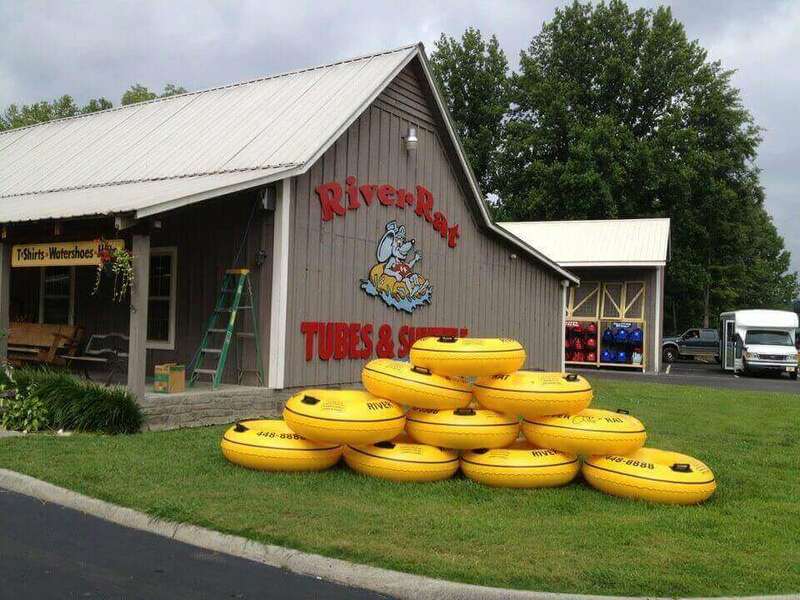 Additionally there is tubing in and around Pigeon Forge and Sevierville, Tennessee and Greenbrier. Rising up and out of the ridges of Clingman’s Dome, the highest point in the park, The Little River twists and turns and flows over mountain boulders and through mountain forests towards the Townsend entrance of the Great Smoky Mountains National Park, where the Townsend Y is created by the confluence of Little River (flowing from the east) and Middle Prong of Little River (flowing from the west). 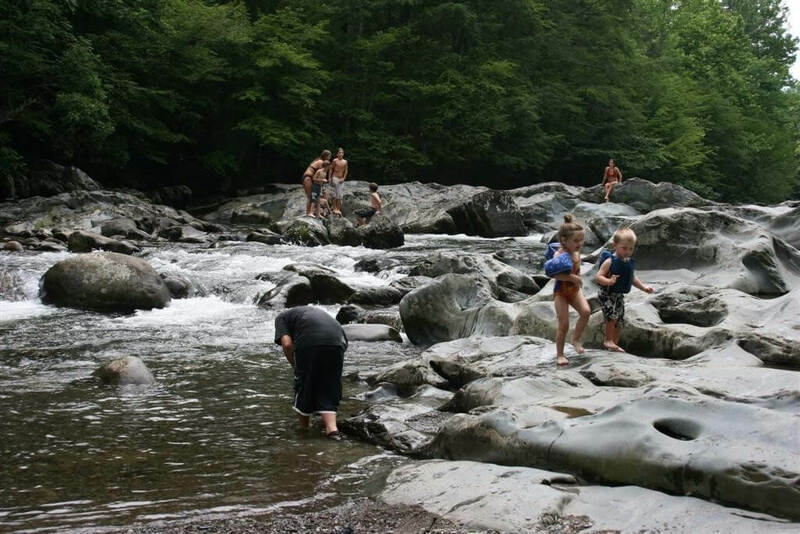 A favorite location for tubing and splashing, the “The Townsend Y,” where the Little River and the Middle Prong of Little River join is one of the most easily accessed and popular tubing areas in the Great Smoky Mountains National Park. 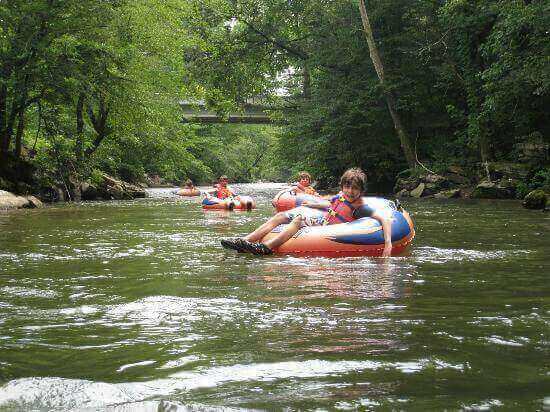 Located just beyond the Townsend entrance to the Great Smoky Mountain National Park, the “The Townsend Y,” is where many tubing trips begin their float trips back towards and through Townsend, Tennessee. Want to go tubing in Townsend? Check out this list of outfitters. 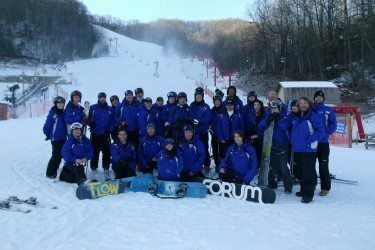 Located on the Western North Carolina side of the park, Deep Creek is considered some of the more adventurous tubing in the park. With water that originates in the mountains springs and flows through the rich and dense forests of the Great Smoky Mountains National Park, these waters too are known to be some of the purest and cleanest water in the Southeastern United States. The Deep Creek Section of the park is located just outside Bryson City has been described as “Nature’s Water Ride” and consists of 2 sections. The upper “whitewater” section of Deep Creek is known for it’s rougher, wilder waters, especially after a good rain. This bumbling ride ends in a deep and wide swimming hole. The upper “whitewater” section flows from where Indian Creek joins Deep Creek through the narrow Deep Creek gorge. The Lower section, which begins at the swimming hole mentioned above, offers gentler and wider route, or a more lazy and loose ride where visitors can lounge and bask in the grandeur around them. Most tube rental companies for Deep Creek are located along West Deep Creek Road. Tube companies offer numerous tube options from old-fashioned tire tubes, to tubes with seats or without, single or double and much more! Once tubes are rented, Tubers can park at the Deep Creek trailhead, where they will carry their tube nearly a mile into the Great Smoky Mountains National Park, before beginning their journey downstream. 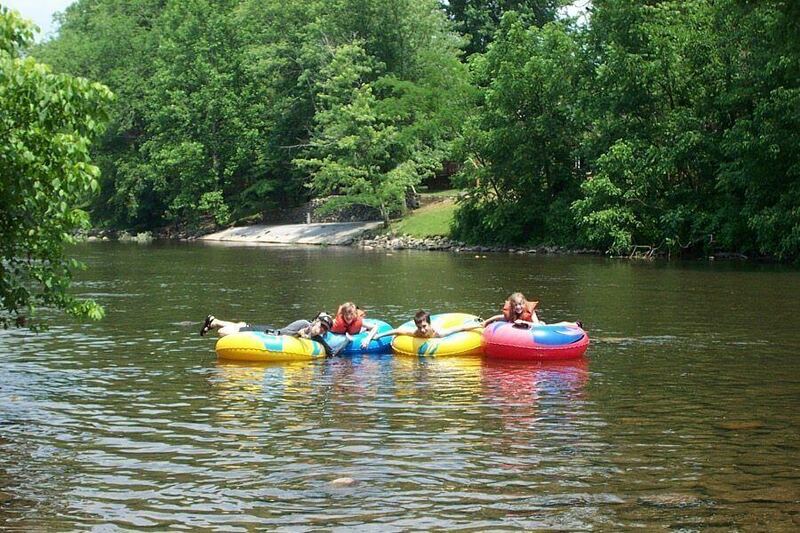 Bryson City has a number of Tubing companies and rental locations, if you’re interested in checking out Deep Creek find a company by clicking here. For visitors wishing to experience a pristine river near the historic town of Cherokee, North Carolina the Oconaluftee River offers a fun and scenic float from this side of the park. 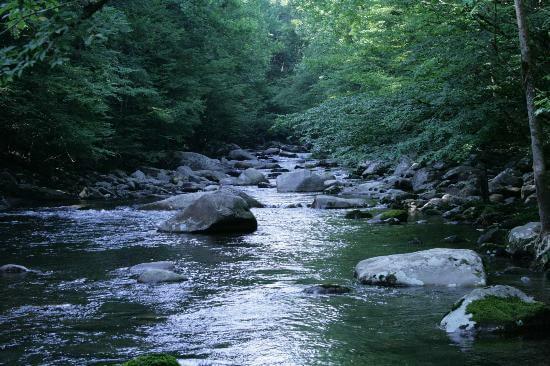 Like other rivers in the park, the Oconaluftee River is considered one the cleanest and clearest rivers on the southeastern United States. Flowing forth from the Cherokee side of the Great Smoky Mountains National Park, these pure waters travel up and out of the park and through the town of Cherokee, NC. Located just up the road from Gatlinburg on 321. The Greenbrier area of the GSMNP can be reached just before arriving at Pittman Center, Tennessee. 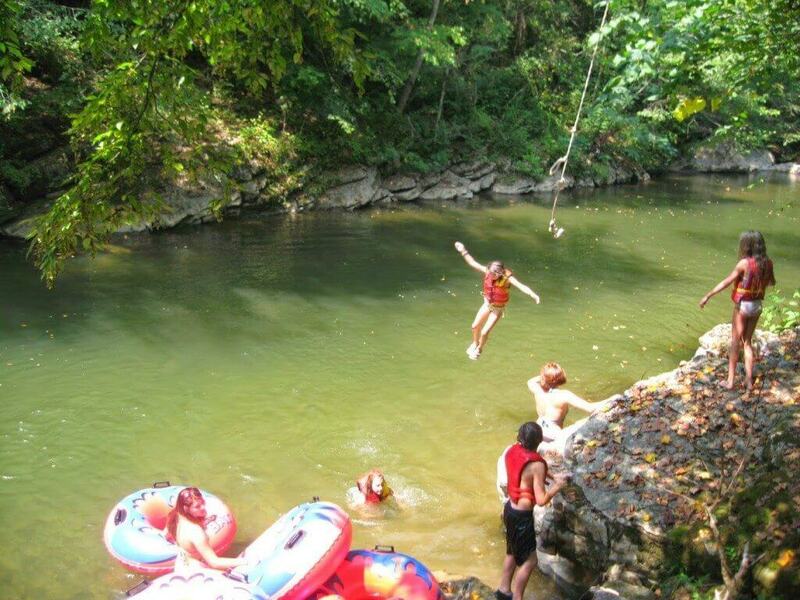 The Greenbrier area is a lesser known recreation area for tubing, swimming and splashing on The Little Pigeon River. The Little Pigeon River is rumbling mountain river that flows over ancient stones, amidst dense forests. The Little Pigeon is fed by several tributaries which include: Injun Creek, Rhododendron Creek, Birds Branch, and West Prong. While this isn’t an official tubing route, you will see pull offs along Greenbrier Road where many locals and “tourists in the know” pull off to take a dip or hop in a tube. 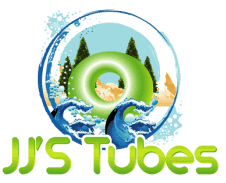 JJs Tube Rental, has a tried and true history tubing the scenic and pristine waters of the Deep Creek Area of the Great Smoky Mountains National Park. A family owned and run business, the Marr family knows tubing inside and out. “We have been in operation for 32 years. Our parents started the business and now my brother Jeff Mar and I run it. Our whole family work in education during the year, so this business really works well with our schedules. JJs Tube rental is named after my brother Jeff, and me Josh. It really is all in the family,” notes Josh Marr. JJs Tube Rental is well known for their old-fashioned tubes, more like truck tire material that have hard plastic seats tied in the middle with rope. These more durable tubes are fit to ride and tame the rapids and keep you comfortable along the way. They also offer tubes without seats in the middle for those who want to dip their bottom, and tubes in kid and adult sizes. Deep Creek Lodge and Tubing Center features a variety of tubes for the rider. Their selection includes traditional tubes, many of which have seats tied in , newer commercial PVC tubes, and some without backs and bottoms. In addition, they offer double tubes for guests wishing to float tandem. 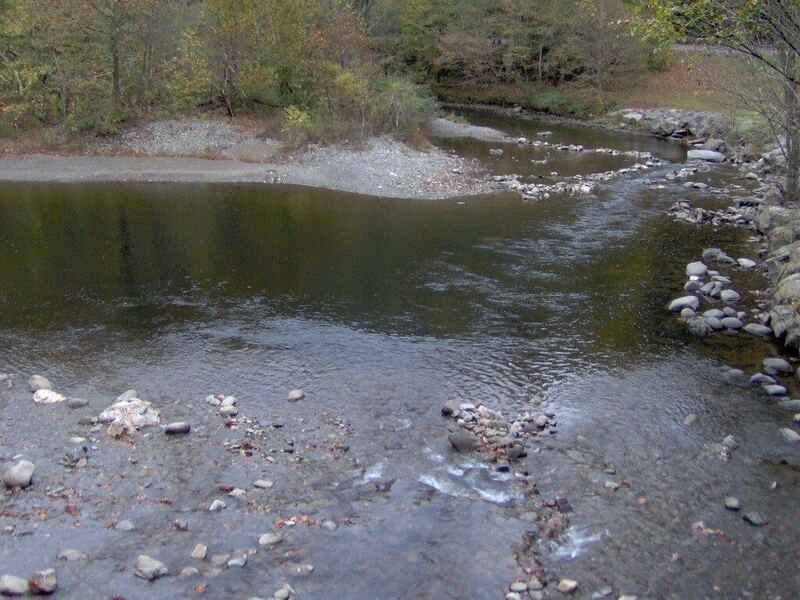 Cherokee Rapids is popular for offering one of the longest trips in the area and their famous “Big Cove” Route. This float trip starts two miles upstream from Cherokee Rapids Little Princess Location. 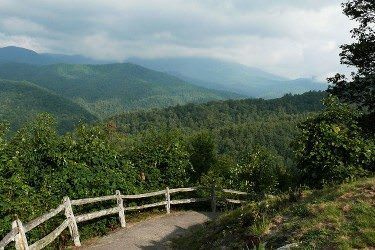 Visitors are shuttled into the Great Smoky Mountains National Park and dropped just beyond the Cherokee Visitors Center. Here they will experience the resplendent nature as they float down the Oconaluftee River among the ancient woods and paths that Native Americans have traveled for thousands of years. Tubers will bumble along fun rapids, swimming holes and even a rope swing for two full miles before floating right up to the Little Princess Location. For guests with smaller children, seeking a more relaxing float trip Cherokee Rapids offers the “Island” Route. This leisurely 2-mile trip includes begins at their Little Princess location and floats down through the town of Cherokee to Oconaluftee Islands River Park. 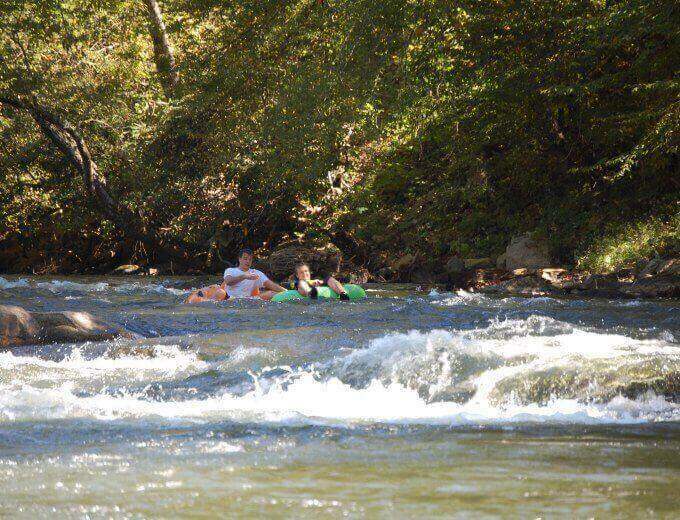 Located in Sevierville, less than 5 miles from Dollywood, River Romp offers a superb location on the banks of the Little Pigeon to take in magnificent scenery and serenity the Great Smoky Mountains imbue. Smokey Mountain River Romp River Romp has been in operation over 28 years. Originally, opened by the Bennett Family in Pigeon Forge under the name “River Run” with several locations, before becoming “River Romp” and settling in its current home at the “old grey barn” on Pittman Center Road in Sevierville. River Romp is a great family tubing option as their route is milder, wider river with 7 swimming holes. Tubers can experience a terrific ride on this magnificent route down the Middle Prong of the Little Pigeon River which originates on Mt. Guyout, the 2nd highest mountain in Great Smoky Mountain National Park (Mt. Leconte being #1). This 2.43 miles long ride includes 7 swimming holes and 5 rippling waters. River Romp offers heavy duty ski tubes, in two different sizes, depending on the preference of guests. Additionally, guest are able to rent tubes to float their own coolers or rent one of our various size coolers to float with them to add to their enjoyment. The Skidmores a.k.a. “The Shannons”, graduates of East Tennessee State University, opened Smoky Mountain River Rat in 1995. This now thriving business is one of the top 3 attractions in Townsend, Tennessee near the Cades Cover end of the Great Smoky Mountains National Park. Smoky Mountain River Rat offers two river trips on The Little River, on an upper and lower section. The Upper section, is considered the more adventurous and scenic route, with rolling rapids and swimming holes along the way. The lower section is a more relaxed ride and family friendly float with a rock jump, rope swing, and gentler rapids than the upper float. For those seeking a plunge or dip instead of a ride down the river, the Great Smoky Mountains offers plenty of cool, clear swimming holes guaranteed to refresh and invigorate all whom splash and swim within them. For those who prefer to just dip their toes, there are plenty of swimming spots with warm rocks to bask on and let the babbling waters sooth and calm you. Midnight hole is one of the best-known swimming holes in the Great Smoky Mountains. 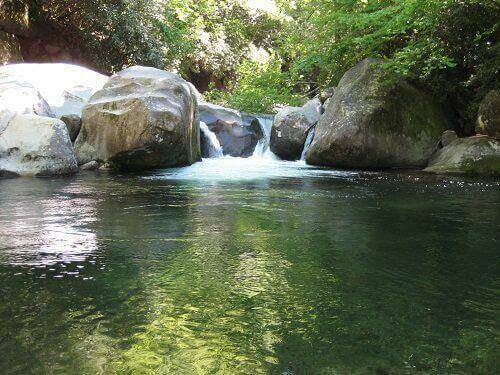 Located at Big Creek on the North Carolina/Tennessee state line, just inside Great Smoky Mountains National Park, this swimming spot is formed where the creek flows between two large boulders. With the sun streaming through, the dark hue of this pool takes on dark shimmering light. The sparkling dark hue of these waters entices onlookers to take a cool dip. The trail to this swimming hole follows an old railroad grade used to haul lumber out of the mountains during the logging boom. The hike to the Midnight hole is 1.4 miles. Before or after your dip, hike the extra half-mile up to view the spectacular Mouse Branch Falls. Located at the far side of Big Creek, these falls stand an impressive 45 feet high. Directions: From Sevierville take I-40 East to Waterville Exit; Turn R then veer L onto Waterville Rd. Follow straight to Big Creek entrance. Pass ranger station and park in lot just beyond Big Creek trailhead. Follow Big Creek Trailhead 1.4 miles and you will see Midnight hole on your left. This waterfall and creek are named for Cherokee Chief Abram, or Abrams, whose village once stood several miles downstream. 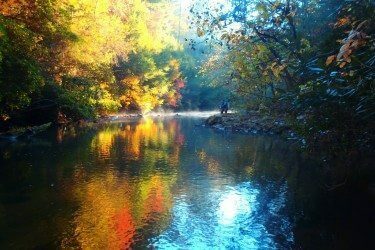 Located in Cades Cove, this swimming hole is a Kodak moment waiting to happen. Although Abrams falls is only 20 feet high, the large volume of water rushing over the falls makes up for its lack of height. The water plunges into a large 100-foot pool at the base that sparkles with laughter and light. While there is a bit of hike to this swimming hole, 2.5 miles from the trailhead, viewing Abrams Falls and lounging in the swimming hole make your arduous hike worth the effort. Don’t forget your camera and swimsuit for this picture perfect spot! Directions: The turnoff to the trailhead that will take you to Abrams Falls is located past stop #10 on the Cades Cove Loop Road. To get to Cades Creek Loop Road from Gatlinburg head north on US 441 for 8.4 miles. Take a left on Wears Valley Road and follow for 12 miles. Turn left on TN-73 and follow into the park. When you reach the intersection of Little River and Laurel Creek Road turn right onto Laurel Creek Road and follow until it dead ends into Cades Cove Loop Road. This picnic area located between Gatlinburg and Townsend offers great access to the Little Greenbrier River. Several shallow swimming holes are scattered along this picnic area. The area is wide and makes for a perfect spot to throw a tube into the water and relax. It’s also the perfect swimming area to have a nice picnic, with many tables sitting along the water. 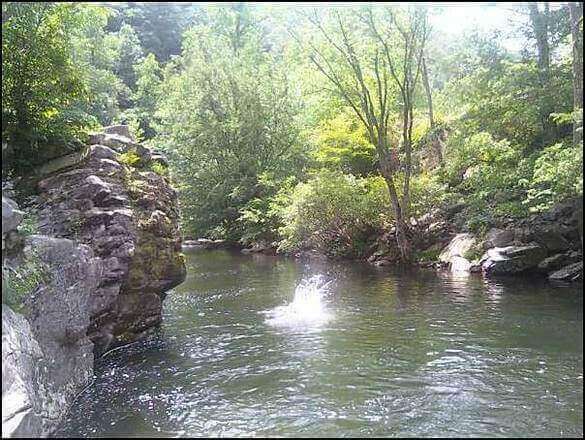 The Metcalf Bottoms are also close to many other attractions in the area, so you can fit in a swim, a picnic, a hike or even some antique shopping. From here you can drive or take the small hike up to the Little Greenbrier Schoolhouse and look at the old one room school house and then venture to the Walker Sisters Cabin (the cabin of the old teachers from the school house). Once you’ve finished swimming, take, Lyons Spring Road to Wears Valley. Here you will experience beautiful mountain views, cute antique stores, and some small local shops. One of the clearest mountain rivers in the park, the West Prong of the Little Pigeon River flows through the Greenbrier area of the Great Smoky Mountains. This is a favorite spot for tubers and swimmers to splash and play in the pristine pools that collect below small rapids. The Sinks – Roaring rapids and deep pools! Be careful and cautious here. Local legend has it that there once was a logging train that derailed here and plummeted into the Little River. No train was ever recovered and since the mysterious crash occurred this area has been referred to as The Sinks. This is one of the easier swimming holes to access and as such is usually popular on hot summer days. The Sinks offers visitors a beautiful waterfall with small cliff and rocks that flow down into a reservoir below. This swimming hole is a mix of rapids and deep pools. Remember this area is very rocky, the waterfall is massive and there are often strong currents; be cautious and never go behind or around the waterfall as this is very dangerous. Take a relaxing drive through the mountains and enjoy your views on your way to The Sinks. See the directions below to get to this swimming destination, depending on traffic it can take anywhere from 30 – 40 minutes to reach your destination. But the view alone is worth the drive. Directions: From the resort head southeast on Powdermill Rd toward Elk Spring Way, turn right to stay on Powdermill Rd, take a right onto Glades Rd for about 1.7 miles then turn right onto East Pkwy. Take a left onto US-441 S/Parkway until you reach Little River Road where you will turn right onto it. This swimming hole is for the adventurer and skilled hiker. The Chimney Top trail is one of the most popular hikes in the area and is great spot to enjoy a swim, beautiful mountain views, and a challenging 1,700 feet climb in a two mile radius (for more advanced hikers in good shape and not afraid of heights). For those of you who are just looking for a place to cool off, this is where you can enjoy the refreshing Little Pigeon River. There are plenty of rocks to jump off into the river, however, be sure that the water levels are high enough for jumping (average level runs about six to eight feet deep). Glide into the nice cool waters and enjoy a lovely picnic with your family. The cascading waters are calming and a great relax. If you’re there for the hike follow the trailhead and be prepared for an exciting and challenging excursion. This 2 mile hike is filled with a rocky ridge-line and once you reach the top a near 360 degree view that is stunning. Directions: The Chimney Tops Trailhead is located 6.8 miles south of the Sugarlands Visitor Center on Highway 441. The trailhead is located on the south (west) side of the road. Also known for its tubing the Deep Creek Trail area offers some great swimming holes for those seeking a splash but not a ride. 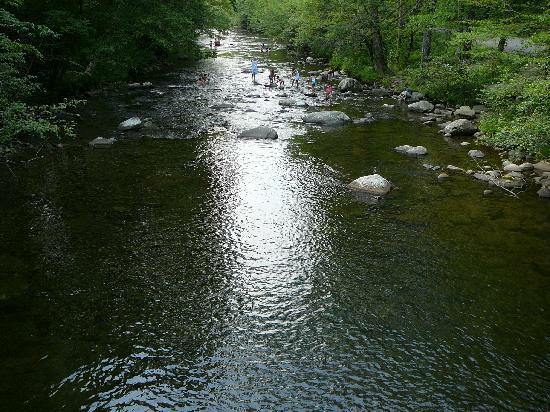 While you may see many tubers passing through, there is an excellent swimming hole where the creek is “deep,” for those wishing to splash and swim. Just over the bridge, nearly a100 feet to where the trail/old roadbed starts to climb uphill a little there will be rock outcroppings that make-up the creek bank. This is where you will see many tubers pulling out or putting in for their ride. This area however is also a great swimming spot because the water is deeper. Directions: From Bryson City, NC follow signs into the Great Smoky Mountains National Park. Once inside the park bear to the left To get to the trailhead and parking area for Deep Creek Trail continue on and bear to the Left past the turn off for the campground on your Right and the large picnic area on your right. The road dead ends at the parking area on the Left. Pick up the main trail just beyond the parking area. Located in the Deep Creek Section of the park. Indian Creek is a sweet mountain stream hat flows into Deep Creek between “Thomas Divide” and “Sunkota Ridge,” just North of Bryson City. 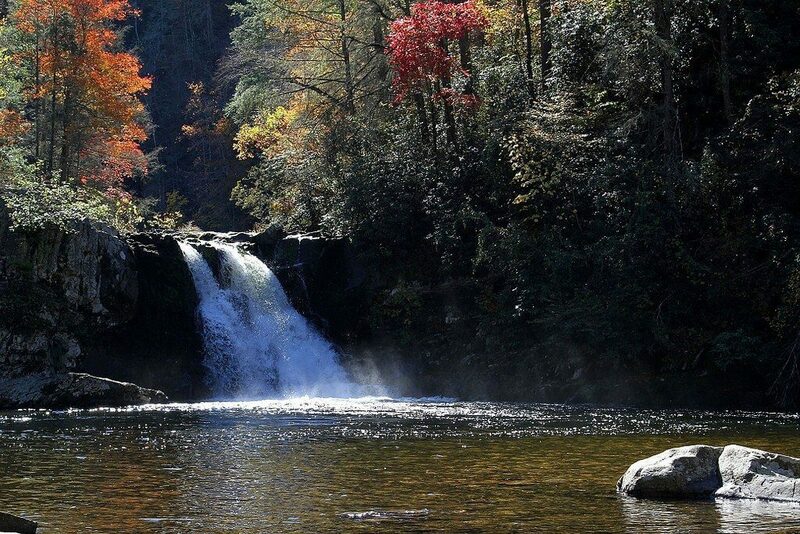 This refreshing swimming hole is located at the base of Indian Creek Falls. This twenty-five foot waterfall cascades down slick rock into a clear pool. Perfect for dipping, splashing and cooling off. Visitors can bask in the beauty of the falls and splash around. Directions: From Bryson City, NC follow signs into the Great Smoky Mountains National Park. Once inside the park bear to the Left past the turn off for the campground To get to the trailhead and parking area for Deep Creek Trail continue on your right past the large picnic area on your right. The road dead ends at the parking area on the left. Take the Indian Creek Trail and be sure to take the short spur trail down the creek bank to “Indian Creek Falls,” approx. 0.1 mile from the Indian Creek trailhead (0.8 mile from parking). The city of Pigeon Forge features an impressive Aquatic Center with both an indoor and outdoor pool. A part of a larger, 86,000square foot Community Center, this Aquatic Center is open to both visitors and residents of the area. Daily, weekly and monthly passes can be purchased. 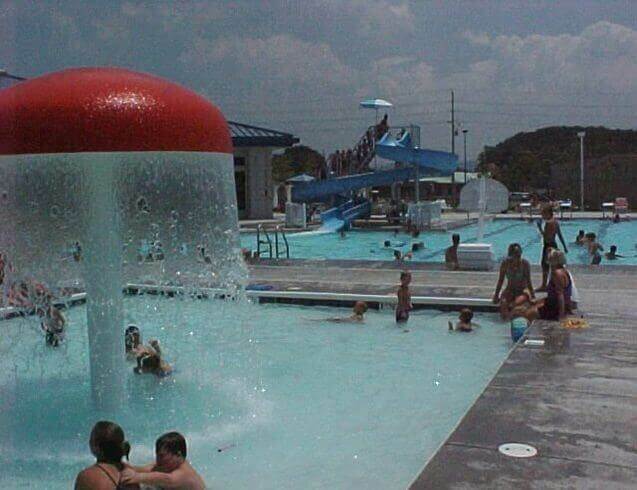 Pool guests can swirl down a super water slide and kids can splash and play in the kids pool with mushroom fountain and more. This newly renovated 25 meter outdoor pool features dual, side-by-side waterslides and plunge pool. It also offers an impressive splash pad area for the little ones in your group with fountains, flying water, sprinklers, and much more. The Family Aquatic Center of Sevierville also offers a snack bar. Located just down the road from Elk Springs Resort the City of Gatlinburg offers an indoor swimming pool all year long. A great rainy day backup, this large pool is located in the Gatlinburg Community Center’s52,000 square foot facility. In addition to their indoor swimming pool, they also feature a bowling center, a fitness area, a gymnasium and racquetball courts. Dollywood’s sister park – Splash Country, is a fantastic place to experience water fun! This wave of water park offers 23 water adventures, slides and thrill rides. 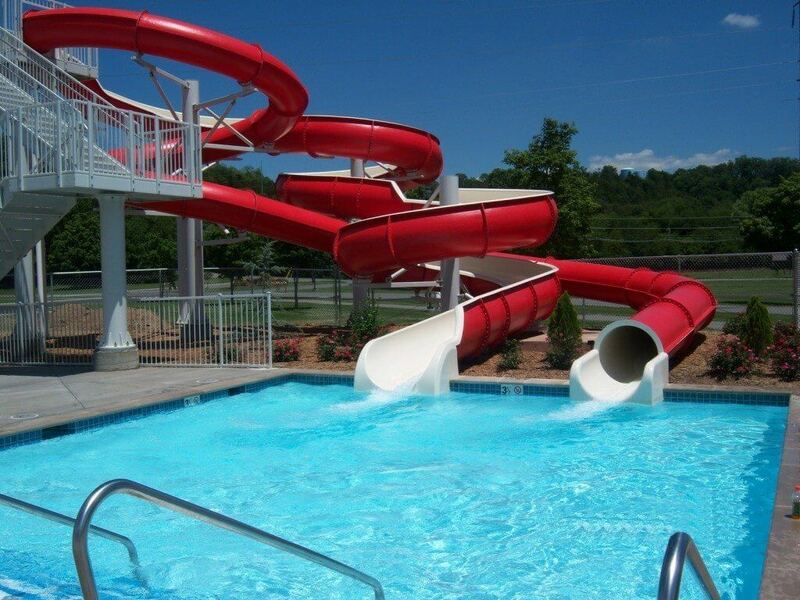 There is something for everyone in the family, from the kiddie water playground areas such as “Cascades and Little Creek Falls” to more daring slides for those adrenaline junkies such as the park’s tallest and fastest water slides, Fire Tower Falls. You don’t need to go the ocean to catch a wave, in fact you can do it right in the heart of the Great Smoky Mountains. At Dollywood’s Splash Country you can ride the waves in their 25,000 square foot wave pool. If relaxation is what your are seeking grab a tube and kick back on the Downbound Float trip attraction, a 1,500 foot lazy river. Families seeking a base camp and relaxing refuge while visiting Splash Country can rent a Retreat or Canopy rental located water and riverside in various parts of the park. In addition, because swimming works up such an appetite, there are twelve different dining options onsite to feed your hungry clan. 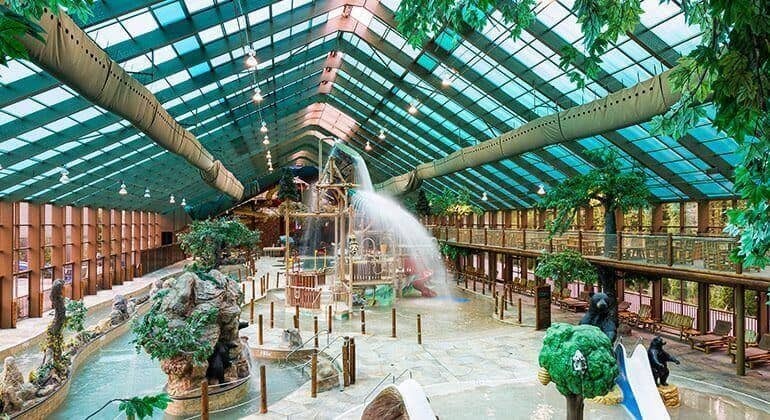 This all season indoor water park, can be enjoyed rain or shine, all year round. During warmer days this mountain themed water park even features a state of the art retractable roof, so visitors can enjoy the sunshine. A family fun adventure, Wild Bear Falls offers plenty of places for the padres to kick back and watch the kids frolic and play, as well as adventure water rides for the whole family. Wild Bear Falls features eight different attractions within the park to delight and divert the whole family. A favorite with the kids, “Ramsey Cascades” is an interactive tree play house with two slippery slides, sprinklers, water spouts, and a 300-gallon water bucket that periodically dumps over the whole structure. For the little tikes in your troop, Wild Bear Falls’ “Little Pigeon River,” is a spray playground exclusively for toddlers. No big kids allowed! The 900 foot “Cades Cove” lazy river is also a favorite among guests who wish to kick back and cool off as the leisurely float in a tube. For those seeking a little more adventure on their tube, the “Clingman’s Dome” ride offers 350 foot long tube slide that will have guest thrilled as they slip, slide and meaner down this slide. For family members really ready for adventure and thrill the “Laurel Falls” body slide will take them twisting and turning them through a 300 foot fully enclosed body slide. Moonshine Hallow and Grotto Falls are the perfect place for Mom and Dad to sit back and relax in these large hot tub areas, complete with jets and more. Finally for families looking to swim and play to their hearts delight, the large “Swimming Hole” pool is perfect to dip under, doggy paddle, and even shoot some hoops at the water basketball area. 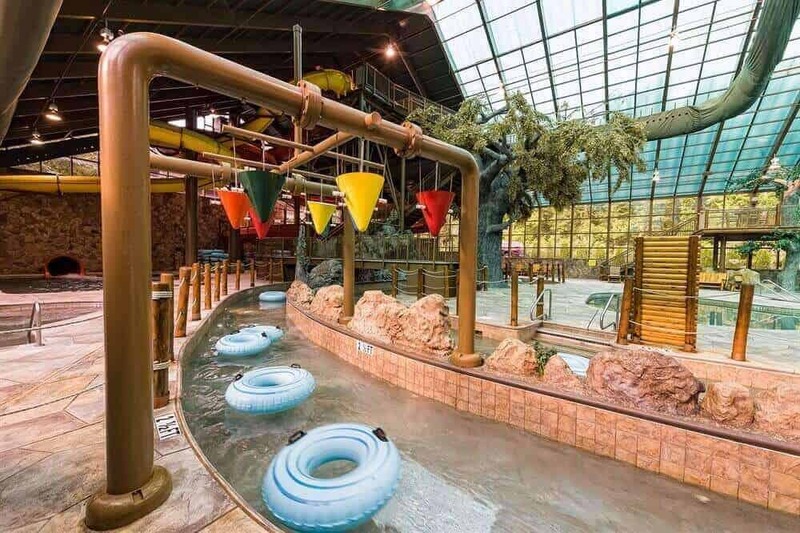 This 60,000 square foot indoor water park will not disappoint, and for guests seeking to dry off and fuel up, Wild Bear Falls also features a snack bar, gift shop and an arcade on the mezzanine level. Conveniently located near Sevierville and Gatlinburg, Douglas Lake is a man-made lake that was created in 1943. This picturesque lake, located on the high Tennessee Plateau at the foot of the Great Smoky Mountains, offers guest the best in pure mountain air and clean water fun. Douglas Lake features over 550 miles of shoreline, with a surface area of more than 30,000 acres. Fed by both the French Broad and Nolichucky Rivers, which both originate in the mountains of North Carolina and Tennessee, Douglas Lake’s waters are cool and clean. 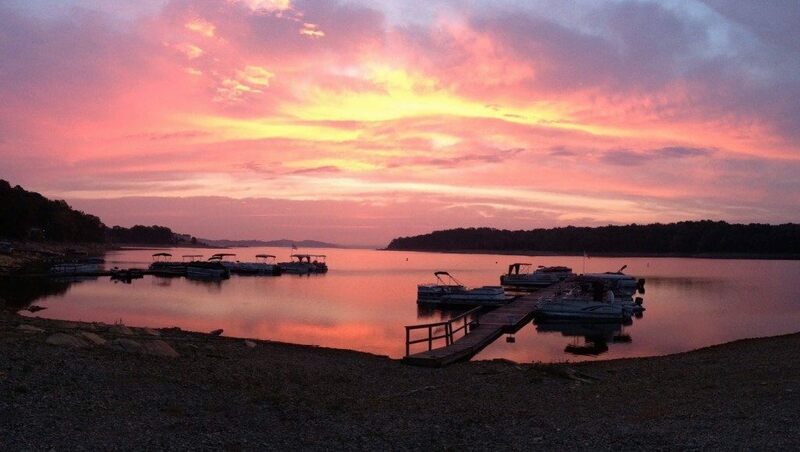 Though much of the shoreline is privately owned, Douglas Lake has marinas, boat slips, and TVA provides recreational facilities at Douglas Dam. This recreational area not only offers public swimming areas, but guests can have a picnic at the group pavilion and camping is also available here.